The only thing better than a day of winter marsh fishing is cooking the results of a day’s fishing, especially when the catch includes speckled trout (also known as spotted sea trout, or spotted weakfish). It surely ranks near the top of Gulf Coast dwellers’ favorite fishes, thanks to sweet, mild, fine-grained flesh. Speckled trout shines when simply fried or dressed up as trout meuniere or amandine. As of late, I’ve taken to grilling or pan-searing ultra fresh spec fillets dusted with a little of Penzey’s Arizona Dreaming spice blend (a mixture of ancho chili black pepper, onion, garlic, paprika, cumin, citric acid, Mexican oregano, cilantro, lemon peel, chipotle pepper, red pepper, jalapeño, cocoa, and other spices). 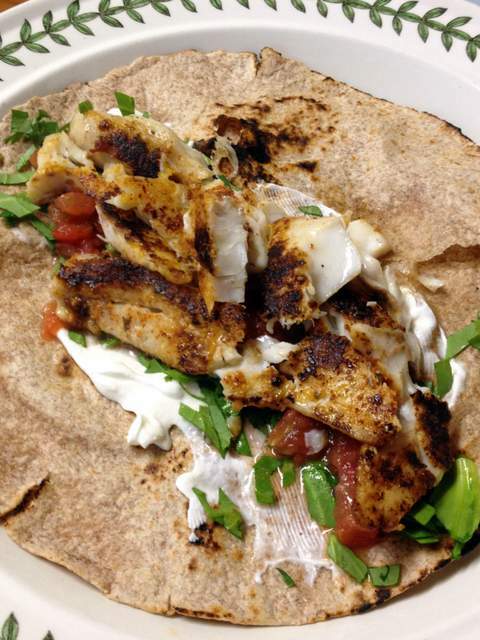 Rolled in a good tortilla along with cilantro, sour cream, avocado, salsa, and a big squeeze of fresh line, the spicy fish makes a damn fine fish taco. Wow, I want one now, and it’s only 6:34 a.m. If I had a magic wand, we’d share one for lunch today. This looks like a very tasty solution to the problem of speckled trout falling apart. Mme. Bouillie, may I ask if you have any recs for lunch near Morgan City? Better half is going to be working down there twice a week for a while. All the food I eat down that way was cooked by family — and most of them live in Thibodeaux now. My go to spot in MC is the Latin Corner, a Cuban place on RAilroad Ave. full menu, but I stick to the Cubam sandwiches, which are big enough to share and piled thickly, poboy style. Rita Mae’s on Federal, Cafe Jojo on Front, and Castalanos Deli are all decent non chain options. Across the bridge in Patterson is Tampico, an old school Mexican resto that’s been in business forever. Thanks! Have passed this info along. I like catching specks but my favorite is chasing redfish! Heading to Perdido Key to do some of that at the end of March. The rub sounds great but Penzy’s doesn’t make anything bad.